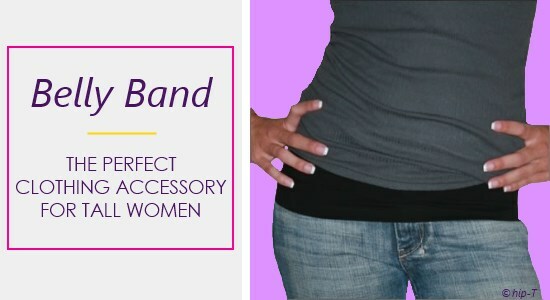 The belly band is the ultimate clothing accessory for tall women. Why? Because they offer lower waist coverage for your long torso, regardless of the length of your shirt or the rise of your jeans. These waist bands are an essential piece of your wardrobe and the solution to many of your clothing problems. What exactly are these bands for your belly? They are stylish, stretchy bands of fabric that are worn around the waist...under your shirt and over your jeans or pants. Used for layering clothing, waist bands cover the midsection that's often exposed on long torso women. They allow you to wear tops that were once too short and low-rise jeans that were once too low. These layering bands are versatile and the length can easily be adjusted to suit your style. And, without straps, they don't ride up like the typical tank top or undershirt. This fashionable clothing accessory can be found in many of your basic colors, which makes mixing and matching easy. 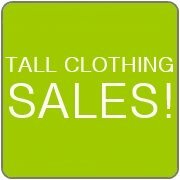 Get yourself several to create a number of different outfits. Some bands even come in chic patterns for a unique look. You will, also, find several options with a pretty lace trim. You can get belly bands at many retail locations, but for easy shopping online, visit hip-T.
For maternity options, see my Bella Band page.